PFF covers the NFL Draft all year round with expert mock drafts, scouting profiles, and advanced college stats. While the 2017 season may not have lived up to the lofty expectations that were set for USC quarterback Sam Darnold, there was still plenty to like when it comes to his future projection. His 13 interceptions raised eyebrows in NFL circles, and they certainly tell a story, as that number could have been far higher and it was worse when adding bad fumbles into the mix. But Darnold’s season is best when broken into two parts. His four worst games came between Weeks 4 and 7, as he ranked 144th among 147 qualified quarterbacks nationally during that four-game stretch. However, taking out those four games and he would have been ranked third in the nation behind only Oklahoma’s Baker Mayfield and Oklahoma State’s Mason Rudolph. One thing to keep in mind: much like Jameis Winston of the Tampa Bay Buccaneers, Darnold burst onto the scene as a redshirt freshman, putting together an NFL-caliber season that put himself into the picture for the top overall pick in the draft. Even with a step back as a redshirt sophomore, few signal-callers have put that kind of quality film together at such a young age. So which Darnold is the NFL getting and what should they expect at the next level? Let’s take a look. Darnold’s high-end plays are as good as it gets in the draft class. He’s a quick processor, which helps him with the ‘easy’ stuff like the quick game, but his fast mind also allows him to eliminate a read quickly in order to get to the open man. It also allows him to maneuver the pocket in order to create plays outside of structure, though that has worked both for and against him in the past. The first thing that stands out about Darnold is how well he throws in between the numbers, and particularly his ability to anticipate passing windows through zones. He has a great feel for throwing away from defenders’ leverage and putting passes where only his receivers can catch the ball. And this pass against Stanford from Week 2 last season. Darnold’s receiver isn’t even open, but he creates a touchdown opportunity by putting the pass up and away from the unsuspecting defender. Sam Darnold touchdown pass against Stanford last year. Darnold’s tape is littered with passes that get dropped into tight windows, but there’s also a healthy dose of out-of-structure plays. He throws well on the run, whether in the boot game or after the breaking the pocket. He also put on a clinic last season when facing and avoiding quick pressure, as he was often able to break the pocket and turn a potentially negative play in to a positive. Here’s a look at Darnold’s pocket movement, creativity, and accuracy outside of structure. Darnold can really throw on the run. There’s no arguing that Darnold’s 2017 season represented a massive step back with regard to ball security. Early in the season, the interception totals were higher than they should have been, and ironically, as he started to get more careless with the ball, his interceptions decreased (six interceptions in his first three games, seven over the last 11 games). Overall, Darnold finished 33rd out of 38 qualifying draft-eligible quarterbacks at avoiding turnover-worthy plays last season. Darnold’s turnover-worthy plays had a few different themes, from off-platform throws, to bad decisions to poor ball security in the pocket. While he’s excellent throwing on the run, and he’ll make some big plays when throwing off-platform, there are a few ugly passes in there as well. Time for some of the bad. Last year’s tape had too many poor decisions from Darnold. Finally, Darnold’s throwing motion will get dissected by scouts this spring as it’s not ‘classic’ and it looks lengthy to the naked eye, but it’s rarely an issue on the field. However, fumbles were a major issue for Darnold last season, as he showed poor ball security when maneuvering the pocket and at other times the ball was just falling out of his hand. Finally, ball security was also an issue for Darnold. One of the best moments of Darnold’s career came at the Rose Bowl during the 2016 season, where he led the Trojans to a 52-49 win over Penn State. This game created some of the top-overall hype for Darnold and rightfully so. He led a 14-point fourth quarter comeback, including a game-tying drive that culminated with a pinpoint 27-yard touchdown that was placed perfectly around three defenders. When he took the field for that drive, it just felt like he was going to get the job done, much like other great quarterbacks. Excellent feel in the middle of the field. Throws receivers open and knows how to throw away from leverage of defenders. Darnold showed that same ability throughout the 2017 season, from an overtime victory against Texas, to a fourth quarter comeback against Arizona, to his game against Stanford in the Pac-12 Championship. 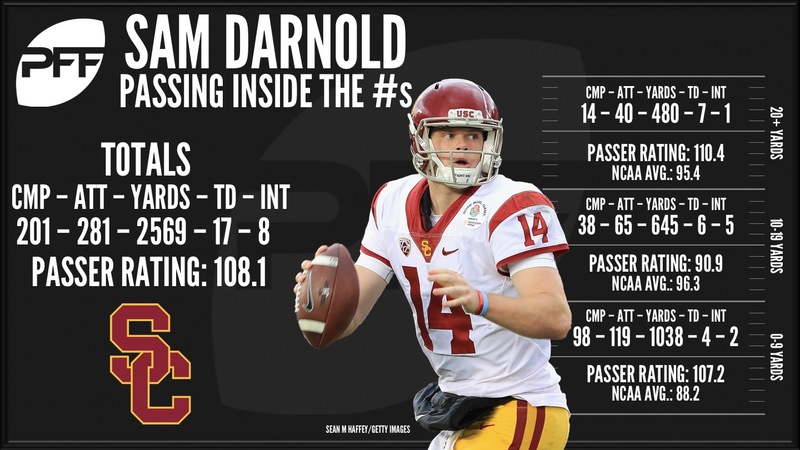 While he certainly isn’t perfect in crunch time – he did have a game-ending fumble against Washington State – Darnold is cool under pressure when the game is on the line and his ability to make plays both within and outside of structure have allowed him to succeed more than he fails. That’s the key to his game, as it’s not perfection, but he’s got the ability to create big-play opportunity multiple ways while showing the amnesia to forget previous failures in order to still perform at a high level. No game showed the latter as well as the Arizona State game in which he missed a high percentage of his throws, but there were two spectacular, NFL-caliber touchdown passes thrown perfectly away from coverage in tight windows. Darnold has the ability to create big plays even in games in which he’s less efficient, an attribute that did Deshaun Watson well for the Houston Texans during his rookie season. Like any quarterback prospect, there’s plenty to love and plenty to dissect about Darnold’s game. His high-end plays look like a Philip Rivers highlight reel, filled with touch, anticipation and just enough out-of-structure plays to keep defenses honest. The bottom-end was concerning last season, particularly the decision-making and the fumbles, but much like we said about UCLA’s Josh Rosen, sometimes the turnover-worthy plays are worth the payoff in order to get to the special throws. However, unlike Rosen, the turnover-worthy plays are less a part of Darnold’s DNA, and his lull in 2017 looked more like a slump than something that will show up week-to-week. 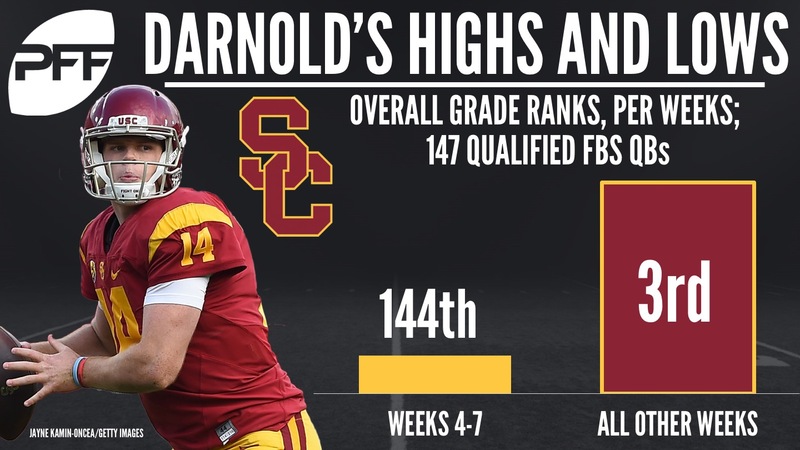 With his ability to work the quick game while adding the big-time throws that open up a passing game, Darnold has the skills to be a complete passer at the next level. It’s just a matter of coaching out a few of the turnover-worthy plays while keeping his confidence high in order to keep the out-of-structure big-time throws that make him a potentially special player.